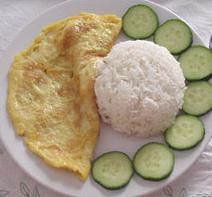 Khai Jiaw may be translated as fried eggs (khai = eggs and jiaw = fried) or Thai-style scrambled eggs. It probably is the simplest Thai dish in terms of ingredients and ease of preparing. Even kids can prepare it for themselves. But it surely is the most popular Thai dish among Thais, especially kids to the extent when Thais have gone abroad for a few days, they would probably ask for Khai Jiaw in their first meal after returning to Thailand. This is a video clip posted on YouTube titled “Train Runs Through Bangkok Market”. Well even to me a Thai, this is amazing. I really wonder where exactly in Bangkok this is. Passing by the Old Bangkok International Airport the other day, I noticed the new airport sign that read “Don Mueang International Airport”. What annoyed me was the fact that they decided to use “Mueang” instead of the usual “Muang”. I know they try to tell foreigners that ‘mueang” should be pronounced differently than “muang”, but will that help? Well, we Thais are flexible “saby saby” people, aren’t we? Phuket is an island in the Andaman Sea of the Indian Ocean, South of Thailand. Phuket is Thailand’s largest island and enjoys great popularity as a travel destination dubbed ‘the Pearl of Andaman’. The island measures 21 km by 48 km at its widest.